So what does it sound like? Let's take a closer look at "The Gem Roller Organ" to see the details. View Roller organs belong to the class of organs known as Reed Organs. Other reed organs include everything from small harmonicas and accordians, through pump organs, and even larger church organs. 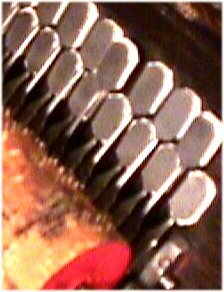 Each reed is securely anchored at one end, and free end has close clearances to a metal frame. The rich full sound is produced as air is moved over the brass reed, causing it to vibrate. The dimensions of the reed give it a particular pitch, as well as voicing characteristics. In a Gem, there are 20 reeds in two banks, each reed with its own pitch: the top bank of D,G,A,B,(middle)C,C#,D,E,F#,G, and the lower bank of G#,A,B,C,C#,D,E,F#,G,A. It will therefore play D, G, A, C, and E major chords and D, G, and A scales, so is well-suited to play in the key of D or G.
So where does the air come from? View A system of an Exhauster and a Reservoir provides a steady air flow. 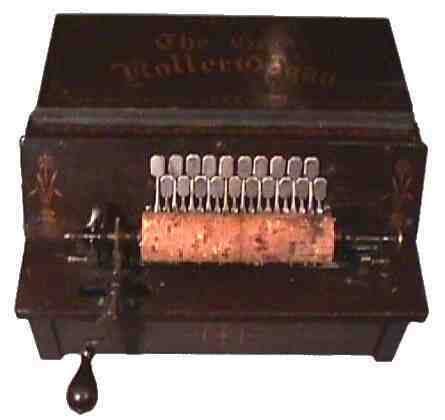 All but the earliest models use vacuum to operate the Roller Organ, which simplifies the design, since the bellows need no inner reinforcement on the cloth sides. As the hand crank is turned, a double-acting exhauster (bellows) underneath the instrument is operated by a wooden arm. Leather flap valves allow a one-way air flow as each half of the exhauster alternately creates a vacuum and then returns to a closed position. The vacuum is then passed to the reservoir, which uses the top of the case as the bellows, pulling against two springs to store and even out the airflow. A small spring-loaded relief valve prevents overly great vacuum by admitting outside air if necessary. A good system will reach maximum vacuum in a couple of turns, while the reservoir will hold a vacuum for a few seconds. How is a note sounded? View Each reed resides in its own air channel, sealed by an oval, leather-on-felt covered metal pallet. The pallet is at one end of a spring loaded lever which is operated by the roller pin (see next question below). 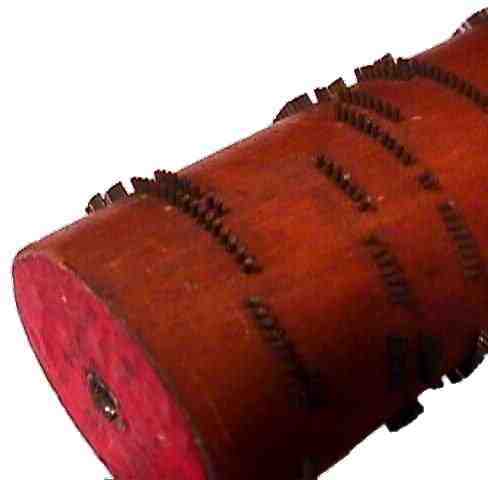 The pallets are large enough to both admit air to vibrate the reed, and to emit the sound from the instrument. 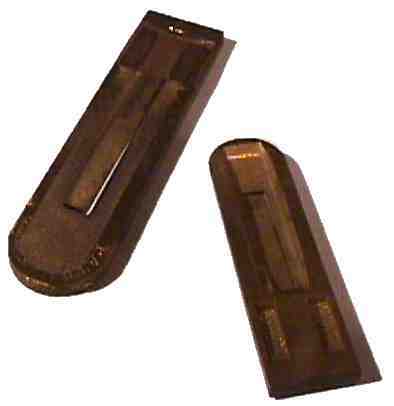 Since the upper bank of pallets have longer levers they open farther and admit more air, so the larger reeds (lower in pitch) are placed in the top bank. How do the Rollers operate the pallets? View Each Gem Roller (in recent years informally refered to as a "Cob", likely due to a vague similarity to a corn cob) contains a single song, lasting about 60 seconds. Hundreds of metal Pins inserted in the cob (by machine) are aligned so as to open the pallet levers at the desired time. The track for each note is laid out in a spiral around the roller, and the song continues for 3 revolutions while the roller is shifted slightly to the right with each revolution. Multiple pins in series hold the pallet open. Interestingly, as the pallet lever slides from pin to pin during a held note, the pallet wavers, producing a vibrato effect. What mechanism controls the Roller movement? View Although the gearing mechanism appears simple, it is a masterpiece of design, controlling five operations at once from a single Hand Crank: First, as mentioned above, the crank operates the exhauster by a wooden rod--each crank revolution producing one exhauster cycle. Secondly, through the Worm Gear, the motion of the crank is translated at a ratio of 28:1 to the rotation of the roller. Hence, 84 revolutions of the hand crank produce the 3 revolutions necessary to complete the song. Third, the Roller shaft uses a 10 threads per inch Feed Screw and Half Nut to shift the roller to the right 1/10 inch with each Roller revolution. 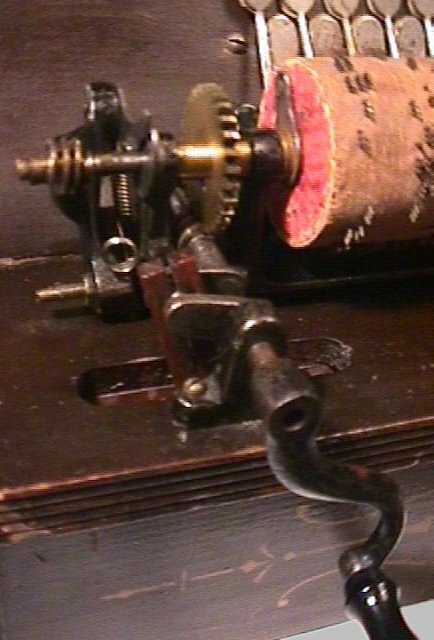 Fourth, a pin trips the carriage Release Lever at the end of the third roller revolution. The Carriage then tilts toward the front (because of the slope of the release lever and the continuing tension of the worm gear), disengaging the screw from the half nut, which allows the spring-loaded carriage to snap to its original (left) position. And fifth, as the carriage reengages the half nut and the hand crank is paused at the end of the song, the organ is ready for another play. So is it difficult to change rollers? View Not at all! 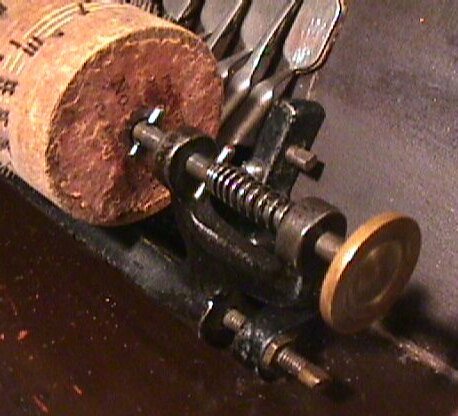 A single spring-loaded knob (at the right-hand end of the roller) is extended, releasing the roller instantly. As the new roller is replaced, an alignment pin (at the left-hand end) prevents misalignment. Releasing the knob locks the new roller in place. Read the original "Directions", as found on the instruments. Or read the abbreviated instructions for both Gem/Concert and Grands, as found on the Roller labels. Why are you so fascinated by the design? View Because a minimum of well-built and well-designed parts still operate a hundred years later! Consider these finer points: The spacing and rotation of the pins and the distance between the pallet levers actually causes the pins to be laid out in a continuous spiral for the length of the roller--greatly simplifying the design and mass production of music. Bronze moving parts provide for long wear, while the cast iron carriage and frame keep perfect alignment. The carriage tips out and around the pins during the reset, with no chance for bent pins or pallet levers. Details of the pallet levers include tips that actually angle to follow the spiral of the pins. The only adjustment necessary is the pivot points of the carriage, and even then it rarely affects the accuracy of the mechanism.